Today, we have a very cute photgraphy at photograph studio. In their marriage, the couple could not have their ceremony to be held, so they came to have a photography with them dressed in wedding gown. They have a very cute 2 years old daughter, and she also dressed up and had their memorial photography, the photography were so adorable. This is their child’s photography. 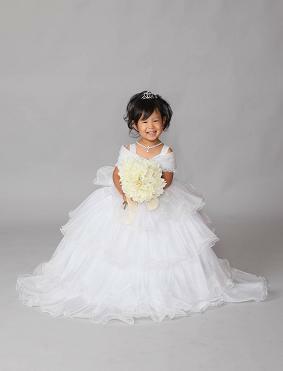 She is only 2 years old, but she has made a great pose and beautiful smile to camera. 20 years after from today, she should be a beautiful bride who has a beautiful smile like this day.